Did this walk a few weeks ago with NWM Hillwalkers. From Clonbur follow the R345 road signposted for Corr na Mona. Just after community centre take the right turn and continue uphill towards Mount Gable. When you reach a minor road junction turn left for Ballard until you reach a ladder stile beside a gate on the right. Follow the zig-zag track uphill until you reach the crest of Mount Gable bringing both Lough Corrib and Lough Mask into view. Swing left and walk along the crest passing a cairn. Keep on past cairn until you reach the concrete trig point at 416m (1,370ft) on the true summit. Leave the trig point and head for nearby cairn overlooking Lough Coolin. Aim for the shore of Lough Coolin, but stay on the grassy slopes avoiding rocky outcrops on the way down. 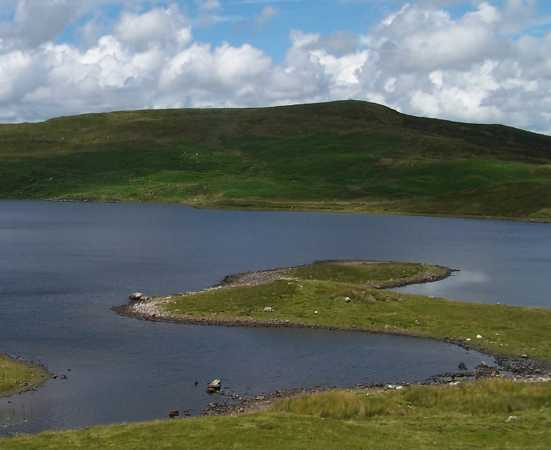 A track on the lower slopes leads to the shore of Lough Coolin. Head for deserted village on lake shore.